Blue Artichoke Interiors: Garden Stools, A Trend I'll Definitely Keep! Garden Stools, A Trend I'll Definitely Keep! There are so many trends that come and go in interior design and I don't love them all. Poufs, for example, are not my cup of tea. I don't like them and probably never will. Give me a more structured ottoman any day. Other trends I like, but will inevitably run their course. Typography is an example that comes to mind. One trend I love and hope will endure is the garden stool. I like the versatility of being a stool/end table/nightstand and also being able to use them indoors as well as out. I have been looking for the right set of garden stools for the right price for a while now and I finally hit the jackpot. Two of my favorite places to drool over stools has been on the Gump's and Wisteria websites. 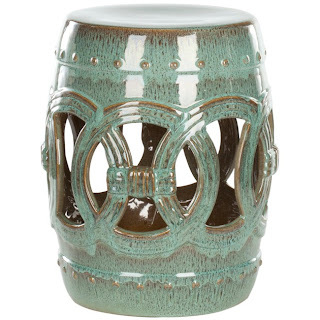 A few weeks ago, while strolling the new Spring decor at my local Hobby Lobby, I spied the garden stool I have been eyeing at the previously mentioned websites for a fraction of the price. Gump's has this stool in this color for $255.00. 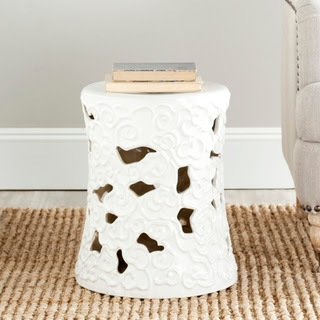 Wisteria has this same stool in different colors for $219.00. I've also seen this at times on Overstock (usually sells out very quickly) for $109.99. This find was for $85.00 at Hobby Lobby. I wanted a pair, but I quickly bought the one and then found a second at another nearby Hobby Lobby. I couldn't be more thrilled that I bought a matching pair for less that I could have purchased one for one of the high end websites. Persistence and patience does pay off many times as this bargain buy proves! If you're not willing to wait it out, check out a good selection of garden stools at Overstock. They have a stool for every taste from sleek and modern to traditional Asian to distinctly feminine! 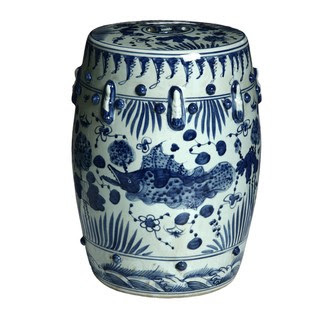 Here's a fish motif Asian stool. Or check out this Safavieh Paradise Cloud White Ceramic Garden Stool at Overstock. I adore the floral design of this stool. Perhaps too feminine to make it into my home, except in a guest room. Are garden stools a trend you love? I'd love to hear your thoughts on one of my favorite and hopefully enduring future classic home decor item.